Lets welcome the recently Revamped MTN SmoothTalk+ Tariff plan that now offers you 15kb for every second level rate on nearby calls following 40kb for each second is charged on the principal moment and Goodybag reward. It is accounted for that the plan doesn't require any subscription charge to opt into and you will be given the standard free 10mb worth of web data to visit and browse your most loved sites at whatever time you make a recharge of 100 naira or more simply like it is done on ipulse Tariff plan. -- Flat rate of 15 kobo/second for calls ACROSS ALL local Networks after the first minute of the day at 40 kobo per second. -- Free 10MB weekly on N100 recharge. -- N400 Goodybag (400 + 500 bonus (25kb per/sec) and many more. 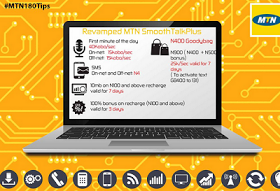 To migrate to MTN SmoothTalk Tariff plan, dial this USSD code *401# or send 401 to 131 in text message. To activate the N400 Goodybag, send GB400 to 131. That's all.